Savannah + The Sauce. You Should Be There. So our good friends at BFG, SCAD & French Paper Co. have invited us to what promises to be an exciting new event for the south east: Band Wagon. 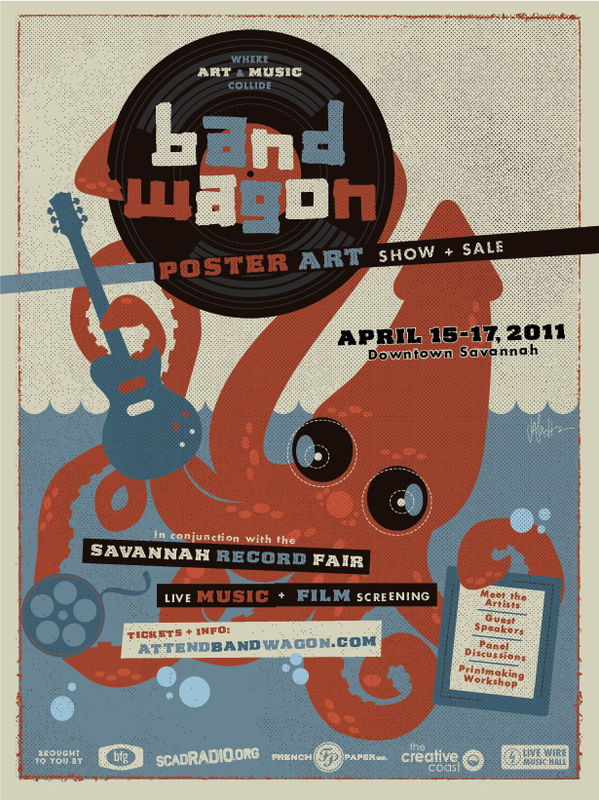 Running in conjunction with the Savannah Record Fair, Band Wagon is going to run April 15–17. This is the first year of the event and it promises to be an exciting annual funfest centered around flat stock printing. We've signed on to design a saucey pull your own poster print as well as give a little ol' lecture of sorts. There will be workshops and talks centered around printing and designing for flat stock by some amazing printers and designers. We're super stoked on setting up shop and letting you pick out a French Paper stock and ink color for you to print your own poster! We bring the design and equipment, you bring your hands to pull the print. Now, I can't promise you anything on the letterpress front, but rumor has it that we may be letting you print your own 11×17 letterpress poster at our booth as well! Just sayin'. If you're a designer, print enthusiast, student in the area, or just a good ol' bloke or blokette who thinks this sounds fun, you should come out and jam with us for the weekend. Check out the site as well as the other fine printin' and design' folks scheduled to be there. Shoot, if you're a fine flat stock folk yourself, you may want to look into grabbing a booth for yourself! See you in low country.